When prepping for your spring and summer tennis matches, it’s always best to have the most up-to-date gear for the season. To help bring your game to the next level, let our gear guide show you what’s hot in tennis right now – everything from racquets and grips to tennis apparel, shoes and gadgets for the court. Designed for fast-paced play on any surface, these shoes feature a stretchy mesh upper with seamless bootie construction for maximum airflow and a comfortable fit. They offer an all-court outsole and a lightweight SPRINTFRAME chassis that helps keep your foot stable during quick cuts. ADITUFF covers the toe and forefoot to protect against foot drag while serving, volleying and making the kind of lateral movements that take control of the match. Available in July (blue colorway) and August (grey colorway). Net mesh upper for superior stability with maximum cooling and airflow; seamless stretch-mesh bootie construction for better fit and unmatched comfort. ADIWEAR 6 outsole, for all courts, offers the ultimate in high-wear durability. Designed for fast-paced play on any surface, these women’s tennis shoes feature a stretchy mesh upper with seamless bootie construction for maximum airflow and a comfortable fit. They offer an all-court outsole and a lightweight SPRINTFRAME chassis that helps keep your foot stable during quick cuts. ADITUF covers the toe and forefoot to protect against foot drag while serving, volleying and making the kind of lateral movements that take control of the match. Available in July (pink colorway) and August (grey colorway). In 2018, Rafael Nadal will defend his title at Roland-Garros. Babolat has chosen to launch a special edition racquet: the Pure Aero Decima. With unique, vivid cosmetics, this racket sums up the relationship between Rafa, Babolat and Roland-Garros.The racquet is the ultimate symbol of passion for tennis, performance at the highest level and victory. On the technical side, Pure Aero Decima belongs to the Pure Aero range: racquets optimized for unparalleled spin and power. 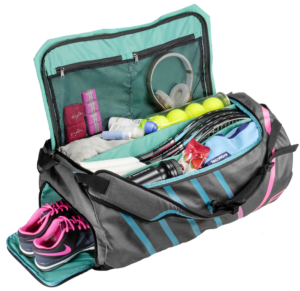 With space for up to 12 rackets, this bag is ideal for players looking for all the best features. The bag includes La Decima and Roland Garros logos as well as the list of Rafa’s championship years. There are three main compartments, two of which are insulated to maintain string tension. It features bigger openings for better access; a pocket with a hard shell to protect fragile accessories; a ventilated shoe compartment with removable shoe bag and two accessories pockets; and padded and adjustable backpack straps. Create a personalized tag at mybabolatbag.com. 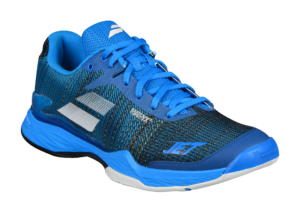 Jet Mach II represents one of the lightest and most supportive tennis shoes on the market, offering a uniquely lightweight feel during play. It gets lighter, you get faster. The MATRYX 2.0 “Stability Arch” system (zone-woven ultra-durable Kevlar and polyamide fibers) forms the Jet Mach II upper, which has been reinforced with four rigid fiber straps, resulting in even more lateral stability and support. The KPRS-X shock absorption system was developed to match the specificity of the game and includes an EVA pad made of high-quality foam with a specific shape and placement to better protect the heel and foot. This year, Michelin and Babolat offer a new compound on the Mach II to improve abrasion resistance and increase traction. Active Flexion (technology developed and patented by Babolat) in the outsole addresses nine key pressure points for maximum responsiveness. Men colors: orange/black, estate blue/fluo yellow, diva blue/black. Women colors: fluo pink/silver/fandango pink, white/fluo pink/silver. Introducing a new team bag that is expandable to accommodate up to 10 racquets in two compartments. Three zippers allow the bag to open to the full size. Two accessory pockets are located on the outside of the bag. It features padded, adjustable shoulder straps and comes in two color combinations: blue/black or orange/yellow/black. Bauerfeind’s Sports Knee Support provides medical-grade compression and stability to protect against excessive strain and injury. 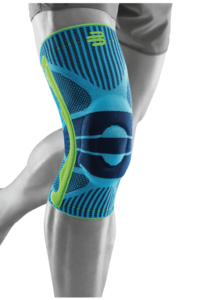 The Sports Knee Support is made of lightweight, breathable AirKnit with integrated massage pad surrounding the kneecap and gripping zones to hold the support in place without limiting mobility. Bauerfeind’s Sports Elbow Strap provides targeted relief for tennis elbow. This soft, durable strap combines a Boa closure system with five-point massage pad and Velcro fastenings to adjust tension, stimulate muscles and relieve pain with millimeter precision. Protect against excessive strain and reduce irritation and inflammation with the Sports Elbow Strap. Bauerfeind’s new Sports Wrist Strap supports and stabilizes your wrist with adjustable tension strap for a custom fit. The Sports Wrist Strap is lightweight, breathable and machine-washable for durable, long-lasting relief that stays in place during movement. Bauerfeind’s Sports Elbow Support provides medical-grade compression to protect the elbow from pressure peaks and excessive strain. Integrated massage pads relieve and stabilize the elbow while the support’s lightweight, breathable AirKnit fabric provides therapeutic compression and a secure, comfortable fit. Bauerfeind’s Sports Ankle Support stabilizes the ankle and protects against twists and sprains. With an integrated figure-8 taping strap and lightweight 3D AirKnit technology, the support’s slim design fits inside athletic shoes to provide stability without limiting movement. The CV 3.0 racquet offers power and workability for players of all levels. The aerodynamic frame of the CV 3.0 racquet generates ultimate spin and power while remaining stable through contact. The CV 3.0 F Tour offers the smallest head size of the CV series line. 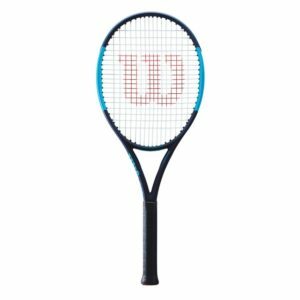 This racquet features a smaller sweet spot to aid in an attack-style game. The CV 3.0 F Tour combines speed, power and comfort in one tour-style racquet for the ultimate performance. The CV 5.0 OS has the largest head with the lightest design in the CV Series, and provides the most power. The larger head size offers plenty of forgiveness and is perfectly suited for a short to medium swing style. The NT Max Plus is a durable co-polyester that offers excellent power to go with ideal bite. This string features a unique coating that helps prevent loss of string tension while maintaining an even string-bed tension. With innovative co-poly material, the NT Max Plus generates both power and control. 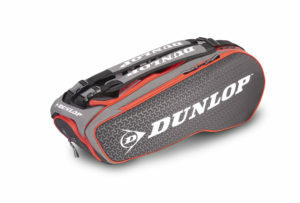 The Dunlop Performance eight-pack racquet bag features two main compartments with thermal protection. There is a large exterior pocket on the front that has venting, which can be used for shoes or dirty gear. Each side has multiple accessory pockets to keep all of your gear organized. In addition, this bag also has a felt-lined pocket for valuables and cell phone, a grab handle and adjustable/removable backpack straps. The Axilus Energized, FILA’s newest tennis shoe for men, offers a perfect blend of style, comfort and performance. 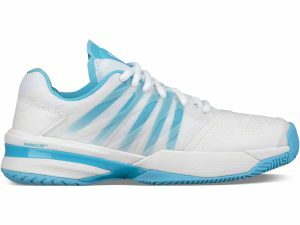 This lightweight, flexible shoe is already worn by top ATP players, including John Isner. As the game of tennis evolves, athletes need to move across the court faster and with greater stability. The Axilus Energized allows just that without sacrificing comfort and support. FILA’s newest performance tennis shoe for women, the Axiuls Energized, boasts a winning combination of comfort and stability in a beautiful, stylish package. Lightweight and agile, the Axilus Energized is already worn by top WTA players, including Karolina Pliskova. 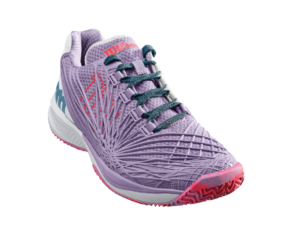 Designed for a sport that continues to evolve, the Axilus Energized will carry you across the court quickly and comfortably. Designed with upbeat, jewel-tone colorways like raspberry rose and blue atoli, FILA’s Sweetspot Collection for women offers festive style and flare to your on-court look. Colorblocked with sharp white, Sweetspot’s racerback tops and body-skimming shorts have a sporty, active feel while touches of illusion mesh add a fresh, light appeal. The nautically inspired FILA Legends Collection for men is a winning combination of FILA DNA and advanced performance details. Available in a mix of yellow, gray and navy, the Legends Collection is highlighted by a tonal space dye effect. Pieces feature high-ventilation double tech mesh, ultra-smooth flat-lock stitching and continuous pockets. Designed like no other for those who play like no other, the MxG 1 features state-of-the-art technology that combines precision-injected magnesium and graphene to provide the ultimate balance of power and control like no other racquet. With a 22mm beam, MxG 1 is the heaviest in the MxG series (10.6 ounces unstrung), which helps provide great stability in a true player’s frame. The MxG 7 delivers innovative MxG technology to beginners and intermediate players who are looking for extra power. Based on a completely new way to engineer a racquet, the MxG 7 features an innovative magnesium bridge construction that allows for longer, free-moving main strings, which leads to a much larger sweet spot and, ultimately, more power. At the same time, the molded bridge ensures that the upper hoop does not deform under pressure, which gives players total control on every shot. The MxG 7 features a large sweet spot (115 square inches) and the perfect balance of power and control. HEAD’s most innovative racquet technology now has its own bag series. The MxG 12R Monstercombi bag features two main compartments on the side, one with CCT+ technology to protect your equipment, as well as two separate compartments in the middle, two inside and two outside accessories pockets, and an integrated shoe compartment. Thanks to the functional backpack carry system, you can either casually flip this bag over your shoulder or onto your back. Matching the MxG design story, the MxG bag series also is available in a 6R Combi bag. The new Ultrashot is designed for competitive players looking for a high-performance shoe with maximum comfort, stability and durability. 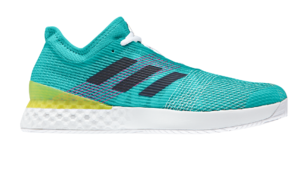 A six-month rubber outsole durability guarantee is available, as this shoe will appeal to high-level adult and junior athletes who play a lot of tennis. 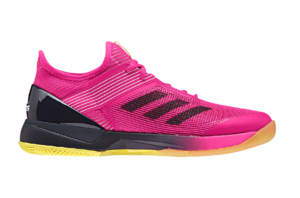 The Hypercourt Express is one of the best-selling shoes in the sport. The shoe is lightweight, comfortable, breathable and has a generous fit. It is a versatile shoe that offers high performance for a variety of player types and levels. Offered in adult and child models. Lucky In Love’s classic V-neck tank with an updated neckline is paired here with their denim-inspired camo skirt with built in shortie. It’s a look you won’t find anywhere else. Lucky In Love’s active fit chevron tank is paired with a chevron print, longer-length skirt. A fresh look as we head into the summer. Training inspired, this is Lucky In Love’s classic long-sleeve shirt with printed pindot mesh sleeves paired with a skirt legging in a vibrant lava. Perfect sun production for going into summer. Alelele Bridge combines a staple aviator silhouette with a rounded lens shape and injected nylon frame that is as light as a feather. 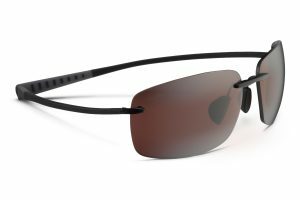 Paired with Maui Jim’s most advanced lens material, MauiBrilliant, its features are designed for longer wear time and superior clarity. Alelele Bridge is the perfect companion for an active or relaxed adventure. Named for the natural arch that formed when flowing lava collided with the cold waters of the Pacific Ocean, Pokowai Arch was developed as a collision of both form and function. Its traditional rectangular shape is pleasing to the eye, and the lightweight material components of a grilamid frame and MauiPure lenses make this a fitting choice for active lifestyles. 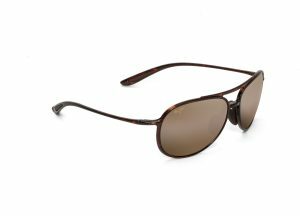 Kumu is one of the first styles to be crafted with Maui Jim’s latest injection molded lens, MauiBrilliant. This sunglass is designed for active consumers with its lightweight, flexible frame. Built with a beta-titanium bridge and rubber sleeves on the temples, wearers receive extreme comfort and a no-slip grip during any activity. Kumu’s eight-base frame and additional lens coverage provide consumers with superior protection from the sun’s harmful rays. The Wave Exceed Tour 3 is the perfect balance of comfort, lightweight construction and stability; the three key elements that tennis players look for in a shoe. Designed for the quicker player who likes to rush the net, and cover every inch of the court, the Wave Exceed Tour 3 has superb agility and flexibility. Now you can master your ‘Serve and Volley’ game and apply instant pressure on your opponent, while the Wave Exceed Tour 3 takes the pressure off you. It is designed to make a one-word statement: speed. The unique linear pattern takes its inspiration from acceleration. But the design serves a purpose, too. Each vertical and horizontal line forms the framework of the shoe’s upper, much like an insect’s wing or the leaf of a tree. Strong, yet light. While the vertical lines on the side of the upper provide increased stability, the horizontal lines improve flexibility. The result is a design so distinctive, it could cause some to take their eye off the ball. The Wave Exceed Tour 3 will debut at the BB&T Atlanta Open. Power Crunch Protein Energy Bars are packed with 13-14 grams of high-quality, super-protein nutrition, delicious flavor and have only 5-7 grams of sugar. These protein bars don’t taste like protein bars even though they are packed with a super-protein. Plus, all Power Crunch products contain balanced nutrition to give your body and mind the fuel they need to feel energized to conquer their day. They are perfect as a healthy, on-the-go snack before/after your workout or tennis match; as a mid-morning or afternoon treat; or even as a healthy dessert after dinner to satisfy your sweet tooth. Available in 10 flavors. The heaviest model of Tecnifibre’s innovative T-Rebound Tempo line is sure to provide great feel and control. The T-Rebound Tempo 290 is great for the competition player looking for a high-performance racquet that generates increased power and stability. Coming in at 10.2 ounces, with a 100-square-inch head size, the 290 is sold unstrung. Tecnifibre’s T-Rebound Tempo line is designed to help you get the racquet through the zone quicker, thus increasing spin and power while maintaining excellent control. Tecnifibre’s new T-Rebound Tempo line is specifically designed to increase racquet speed, spin and control. The T-Rebound Tempo 260 has a 105-square-inch head size and is perfect for the doubles player looking for a forgiving racquet that generates maximum power and spin. 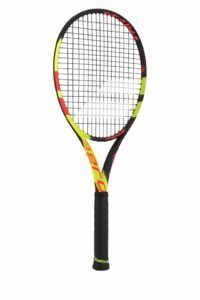 The 260 weighs 9.1 ounces and comes pre-strung with Tecnifibre’s TGV. Tecnifibre’s new Rebound Endurance Backpack will definitely keep you looking stylish on and off the court while still providing enough room to carry the essentials everywhere you go. The new backpack from Tecnifibre is lightweight while still maintaining the level of durability that Tecnifibre prides itself in on its bags. With a large main pocket and a separate two-racquet pocket, you are sure to find ample storage. This backpack will let you walk out in style and comfort. Tecnifibre’s new Rebound Endurance Rackpack brings trendy new colors to its original Rackpack Pro, one of the most innovative bags to hit the market in the last few years. Featuring dividers in the main compartment, the Rackpack is perfect for the player who loves to keep everything organized and in its place. This Rebound Endurance Rackpack will turn heads wherever you play. French pride is found throughout Tecnifibre’s product line, and the new Air Endurance bag line is no exception. The Air Endurance Rackpack, a cosmetic update to the original Rackpack Pro, comes with new, French-inspired colors and is sure to draw attention on court. Featuring racks inside for organization, and all-in-one carrying system for versatile transportation and a coated ripstop construction for lightweight durability, the Air Endurance Rackpack will please anyone looking to keep all their gear organized. Tourna SOFT TAC has an amazing feel that is both tacky and soft. It provides superior sweat absorption, while other grips put moisture back in your hand causing your grip to slip. The .45mm thin overgrip wraps over any handle.Enjoy the unique, tacky feel of soft TAC while not sacrificing the sweat absorption of a high-performance grip. Available in neon green and neon yellow. 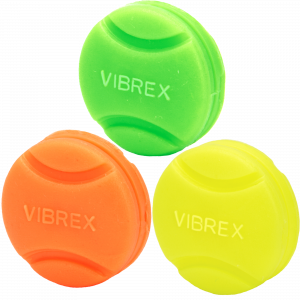 Dampen the vibration of your shots with the new NEON Tourna Vibrex. Each pack contains three dampeners, which are shaped and grooved like a tennis ball. Does your game have grit? The innovative Tourna Grit is the first string made with Nano technology and gives the string a gritty feel. The tiny strings of graphite are 10,000 times thinner than human hair, yet 100x stronger than steel and 80 percent lighter. The result is an extremely elastic poly string that imparts incredible liveliness, feel and pop. Tailored fit. Three-button ribbed comfort collar. Mesh piecing in high sweat areas. Flatlock stitching. Matte finished buttons. Soft spanny neck tape with hook. Split hem for added mobility. Embroidered logo. Fabrics from Italy. Our best-selling short. Not just an athletic short – this is the short in which you can be athletic. Perfect, tailored fit unique to Uomo Sport, for style, comfort and performance. Eight-inch inseam with full-coverage mesh panels. Fully functional zip fly with Cobrax snap for a secure fit. Elasticized waistband. Side rafting for added style and ventilation. Lightweight moisture-absorbent fabric in pocket bag so you can dry your hands during the match. Split hem for added mobility. Embroidered logo. Fabrics from Italy. Tailored fit. Comfort-ribbed neckline. Mesh piecing in high sweat areas. Flatlock stitching. Soft spanny neck tape with locker loop. Split hem for added mobility. Embroidered logo. Fabrics from Italy. The tracksuit made for the versatile guy – perfect for those trips to the airport or to grab lunch on the town. Finished neckline with soft spanny next tape. Branded waterproof zippers. Breathable mesh. Flatlock stitching. Striped waistband, collar and cuffs. Fabrics from Italy. The Ultra 100 Countervail is the most versatile racquet in the world. 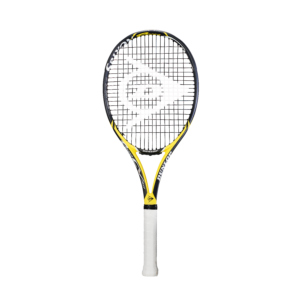 Featuring Countervail technology that maximizes player energy and integrated power technologies that get the most boom for your buck, this racquet is a game-changer for players of all levels and styles. Through innovative Sensifeel technology, the Rush Pro 2.5 enhances comfort without compromising the stability that drives explosive speed. Sporting clean lines and matte finishes, the Rush Pro 2.5 melds a game-changing design with contemporary color schemes – an appealing combination for any tennis player. The Pro Staff 97 Countervail combines the sleek tuxedo look of Roger Federer’s new Pro Staff RF97 with the enhanced precision, consistency and energy derived from Countervail. The next evolution of ultimate performance has arrived to the Pro Staff franchise. 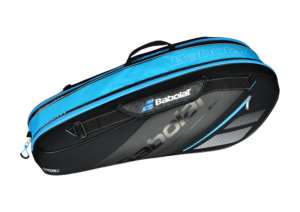 Featuring a sleek new bag design that matches the bold colors of Blade’s racquet franchise, this Blade Collection bag holds nine racquets and contains additional personal storage space with durable exterior side pockets made of carbon polyurethane.